Well-drained soil of good fertility. Good. Where winters are mild, well-rooted plants survive one winter and bloom heavily the following spring. Mix a light application of a balanced organic fertilizer into the soil prior to planting. In late spring, drench plants with a liquid fertilizer just before they come into bloom. 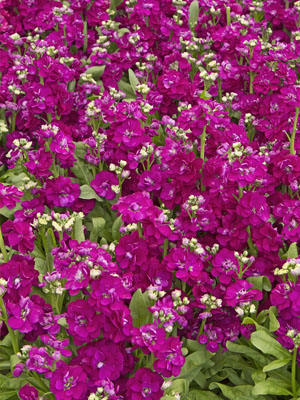 Stock is grown for its fragrance, so it is a good plant for containers or outdoor sitting areas. Sow stock seeds in midsummer to have seedlings to set out in early fall, or sow indoors in late winter and set plants out at about the time of your last spring frost. Stock has a shorter bloom time than many other annuals, but it does quite well when handled as a hardy annual in cool maritime climates. Colors include white and many shades of pink. Pinch plants every few weeks to keep them in bloom as long as possible. Gather blossoms to use as cut flowers just as they open. Stock is not tolerant of hard freezes or humid heat. Fragrant stock grows best in cool climates.